We’re having lovely fall weather here. Temperatures beg for sweaters (or my coveted denim jacket), long walks in the earlier-every-day twilight, and the air smells of spiced lattes. I love the sense of festivity that comes as the first maple leaves yellow and plummet to the lawn. Pumpkins grimace, turkeys run for their lives, and winter holiday decorations begin to encroach on my mellow sensibilities. For Zozo’s first Halloween, I dressed him in my purple, glittery fairy wings before James could return home from work and talk me out of it. The doorbell rang, and a little girl dressed as Tinkerbell (with the same wings, mind you) freaked him out so much that the wings and his tolerance for the doorbell were forever ruined before I could get a picture. You’ll have to trust me. He looked glorious. We’re usually out and about during trick-or-treating, or hiding in the basement around a laptop watching Netflix on-demand when the kids would come knocking. Yes, we’re that house. Please don’t egg us. 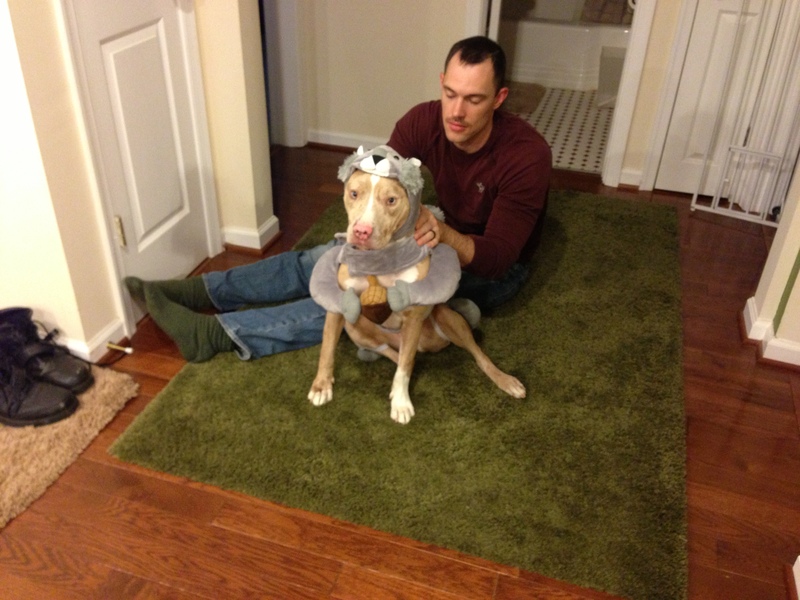 This year, a friend sent us a picture of a pittie wearing a costume. If we’re Facebook friends, you can see the picture. If we’re not friends: shame on you. Here. 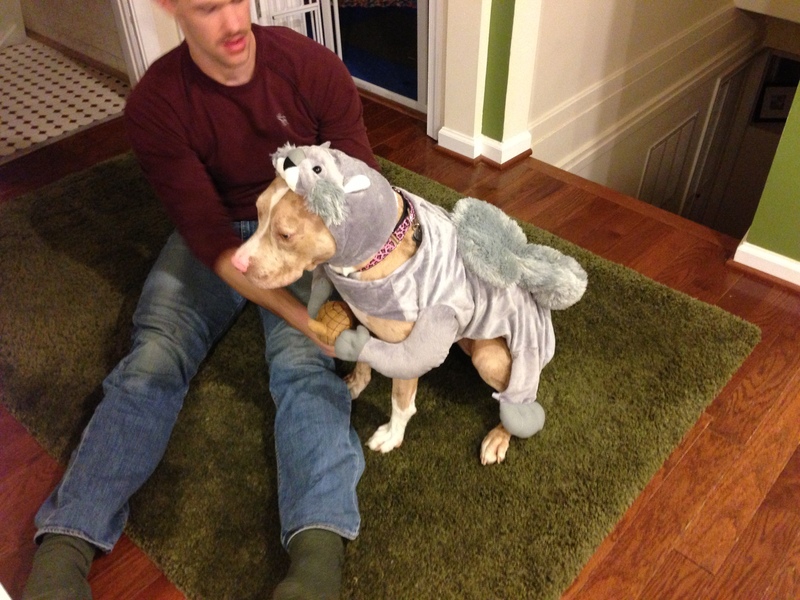 From the first moment I snorted, I knew it had to be mine– the costume, not the pup. The pup seemed to be in fairly good hands. A Google search led me to an eBay auction, and my wonderful husband bid on what will surely be the greatest source of entertainment in our household for-ever. And so, folks, here’s an early All Hallow’s gift for you. MJ’s costume. 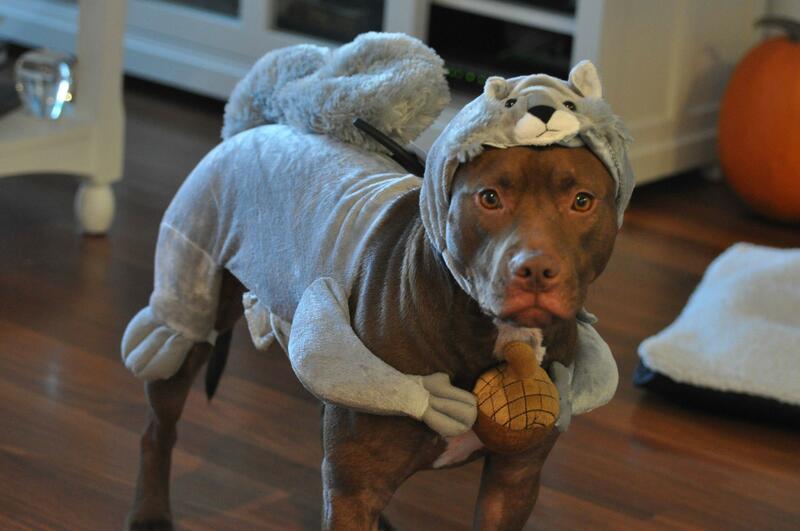 This entry was posted in 2013 and tagged dressing up dogs for Halloween, eBay, fall, Google, Halloween, MJ, Netflix, rescue dogs, spice lattes, Squirrel Costume for Dogs, this post made james laugh out loud, Tim Gunn, Zozo by klgf. Bookmark the permalink. She didn’t wear it for long, I promise! Enough to take some pictures, and then it was removed, folded nicely, and placed at the bottom of her clothes basket. 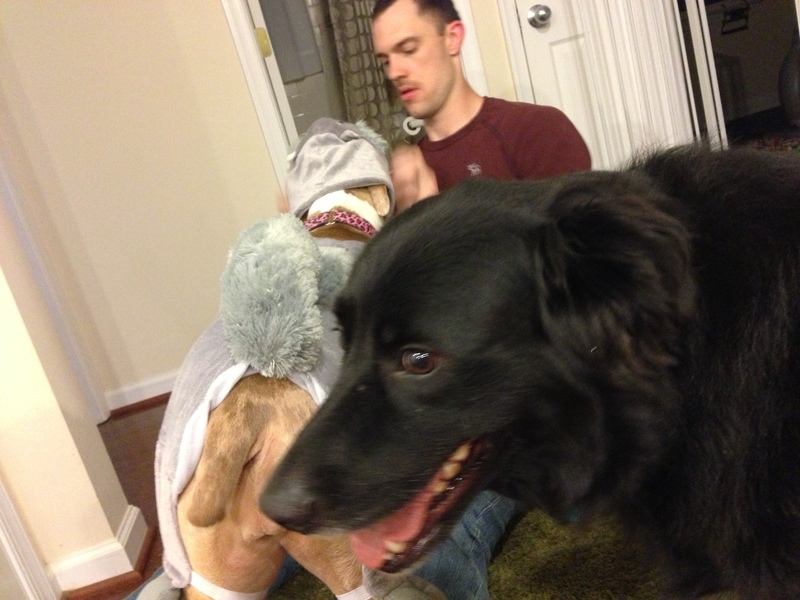 But Dakota, we’re happy to share costumes…. 🙂 Happy weekend! BAHAHAHAHA! Mr. Ripken used to love to put on a human banana costume and run around like a mad man in it. Dog costumes are always funny (when noone is harmed in the process;))! a banana! i LOVE it! !